This ancient wayside cross must have been both a blessing and a dread for early travellers across the moor, to those coming down from the wilderness it probably was a most welcomed sight but for those about to enter upon the wastes it must have been a sickening reminder of what lay ahead. The cross goes by two names; Marchant’s or Merchant’s Cross and probably dates to around the 13th century, in fact Hoskins (2003, p.4340 relates how a document of 1291 refers to the cross. . In Crossing’s day the old granite cross proudly wore the badge for being the: “tallest of the moor crosses”, (Crossing 1987, p.50) but events in 1937 slightly changed that as will be seen later. There is no explanation of the cross’s name apart from the possibility that as the cross marks the old monastic track which ran between Plympton Priory and Tavistock Abbey and the Abbot’s Way it may allude to the merchants who used them, (Harrison, 2001, p.102). Alternatively Starkey (1989, p.22) suggests that the cross and the bridge which spans the river nearby were both gifts from some guild of merchants or a single merchant. Hemery (1986, p.171) also contends that the cross may have been a meeting place where merchants and their customers would carry out business transactions. It seems a good possibility that the cross today still stands at its original position and the alignment of the arms certainly points toward the nearby ford and bridge on the river Meavy. As far as the cross itself goes the vital statistics are: height: 2.37m, circumference: 1.11m, arm-span: 69cm and a NNE – SSW alignment. On the western face is an incised cross measuring 65cm x 33cm and another carved cross appears on the eastern face measuring 69cm x 64cm (Sandles, 1997, p.64). Crossing (p.51) explains how Dartmoor tradition has it that the cross marks the grave of a suicide but then discounts this idea on the premise that the cross was erected for primarily for guiding people and marking boundaries. However, it is commonly known that suicides and criminals were often buried at the intersections of roads and tracks in order to confuse the departed spirit should it ever return. In this light it is just possible that such persons were buried near in the surrounding turf near to the cross. It has also been said it was at the cross where travellers heading up onto the moor would kneel and ask for Divine guidance and protection during their journeys. This can well be believed as any traveller in days gone by must have been filled with trepidation of crossing the windswept moors, especially if the mist was down or the light was failing. 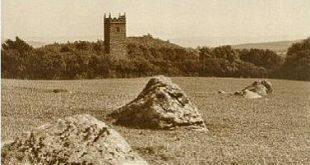 In the early days of Dartmoor antiquarian studies it was thought that Merchant’s Cross was at one time known as Smalacumbacrosse (or Smallacombe) which was a boundary marker on the lands of the Countess of Devon which she left to Buckland Abbey. Probably the greatest supporters of this theory were Crossing, Masson Phillips and R. H. Worth but in 1942 a paper of Worth’s was posthumously published in the Transactions of the Devonshire Association in which recanted on this idea. Since then many other Dartmoor experts have refuted the claim and modern thinking remains with the original name. It was mentioned above that at one time the cross was the tallest of the moorland crosses, but in 1937 this claim was put into question when a Morris car driven by a Mr Jury lost its brakes on the hill and drove straight into it and pole-axed the cross. The impact of the vehicle had the effect of breaking the shaft clean in two at a height of about 150mm below ground level. The cross was restored and re-erected under the supervision of a Royal Navy captain called Gerty, the actual work was carried out by a man called Trathen from nearby Walkhampton (Harrison, p.101). The Dartmoor Archive carries a picture of the cross lying prone on the roadside – see HERE. The same repository also carries an early photograph of the cross taken in 1888 by Robert Burnard – see HERE. A similar event occurred in 1984 (Hemery, p.171fn) and 1990 (Hemery, 1999, p.33) although this time not so much damage was done and the Dartmoor National Park Authority managed to carry out repairs and re-erect the cross. Amongst the visitors to the cross was an OS surveyor as is testified by the cut benchmark at ground level on the eastern face and has a spot height of 157.8803m (thanks to Bernie for this information). As a slight aside from the topic of the cross, it’s interesting to note the old postcard illustrated in the ‘Marchant’s Cross – Then’ picture opposite, because in the background, stacked against the wall is a winter store of bundles of wood, or faggots once used for heating and cooking. Hemery, E. 1986 Walking Dartmoor’s Ancient Tracks, Robert Hale, London. Hemery, P. 1999 The Book of Meavy, Halsgrove Publishing, Tiverton. Hoskins, W. G. 2003 Devon, Philimore & Co. Ltd., Chichester. Starkey, F. H. 1989 Dartmoor Crosses, F. Starkey, Exeter.